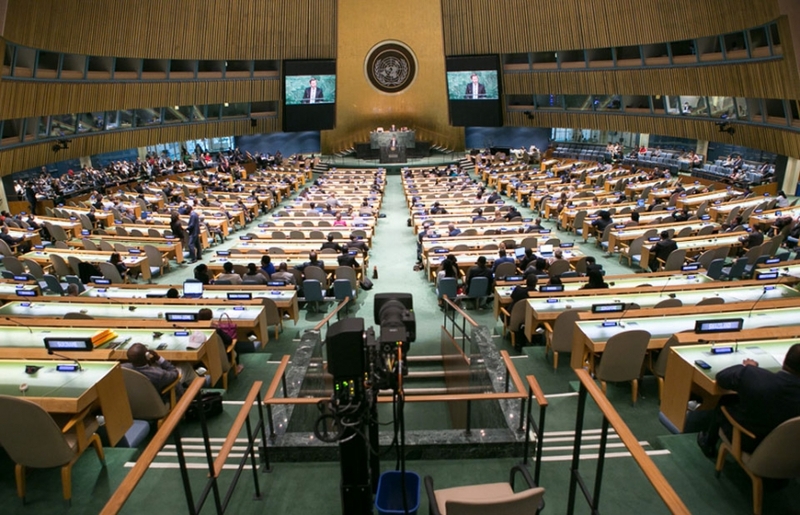 NEW YORK — Last week, United Nations members agreed on a political declaration on ending AIDS by 2030, with some new and old commitments. Alongside the 8-10 June High-Level Meeting on Ending AIDS, a side event looked at issues of access and got into intellectual property rights issues. The UN Political Declaration on HIV and AIDS: On the Fast-Track to Accelerate the Fight against HIV and to End the AIDS Epidemic by 2030 is available here. Information about the High-Level Meeting is here and here. The opening session webcast is here, and related following plenary sessions may be found in related videos. Many commitments follow on those made in the last declaration, in 2011, according to sources. A number of paragraphs in the declaration relate to access to medicines, research and development or similar issues, including: 23, 37, 52, 59, 60, 64, and 79. It includes reference to the flexibilities to patents in the World Trade Organization Agreement on Trade-Related Aspects of Intellectual Property Rights (TRIPS). Numerous governments took the floor to make statements during the week. But the United States issued an “explanation” of its position on a specific point, complaining that human rights related to stigma and discrimination were not sufficiently addressed in the declaration. And for reference, here is the US statement [pdf] to the High-Level Meeting. Also, in context, the US announced during the week a $100 million investment fund to increase access to HIV services for key populations. But it also used the opportunity to accost the UN Secretary General’s High Level Panel on Access to Medicines, which is working to find alternatives to the longstanding problem that for years has gone nowhere in policy bodies like the World Health Organization. “We believe the Panel has the potential to divide rather than to bring together countries, patients, and stakeholders,” the US statement said. “The United States hopes that any recommendations from the Panel or the Secretary-General will not divide us, but further the goals of both access and innovation and find common ground for future work on this critical issue.” The US takes particular issue with the way the panel was formed, despite its varied and high-level makeup, and also with the premise that there is policy incoherence with regard to access to medicines. A number of side events were held during the week, including one by the Geneva-based Medicines Patent Pool. Another one was entitled, Scaling local pharmaceutical production to end AIDS by 2030 (webcast here), jointly convened by the West African Health Organisation (ECOWAS) and UNAIDS. Yet another was entitled, Addressing global health emergencies: lessons from AIDS to Ebola, Zika, and other emerging epidemics (webcast here). One more was called, Ending AIDS by 2030 In West Central Africa (MSF and UNAIDS) (webcast here). A separate 10 June side event (webcast here) was put on UNAIDS, the 2016 High-Level Meeting on Ending AIDS, and the UN Development Programme (UNDP). The event was titled, Accelerating Access to Treatment to Achieve the SDGs. It included a focus on the High-Level Panel on Access to Medicines, which is expected to finish its report by the end of this month or soon after. The event was moderated by Mandeep Dhaliwal, director, HIV, Health and Development Group at UNDP. In her introductory remarks, she called attention to the crucial role played by thousands of activists and others in bringing about the movement to end HIV/AIDS, including through partnerships. Simon Bland, director of the UNAIDS New York office, noted that the political declaration this week committed members to implementing specific targets to ending AIDS. He noted that there are many barriers to universal access, which he said need to address this. The objective is to stimulate R&D while guaranteeing access, he said. Bland also mentioned new O’Neill report on antimicrobial resistance, more ability for people to know their HIV status, the use of new technologies, and finding less toxic regimens for children. Malbona Precious Matsoso, director-genera of the South African Department of Health, said that 20 years ago, HIV/AIDS in South Africa was a “death sentence with no hope in sight.” Drugs were too expensive for most people. Today, the country has been able to put 3-4 million people on treatment. This would not be possible without generic competition, she said, they would not have achieved this if not for early generic entry, which she said is under the TRIPS Agreement. South Africa’s statement to the UN High-Level Meeting last week is available here [pdf]. 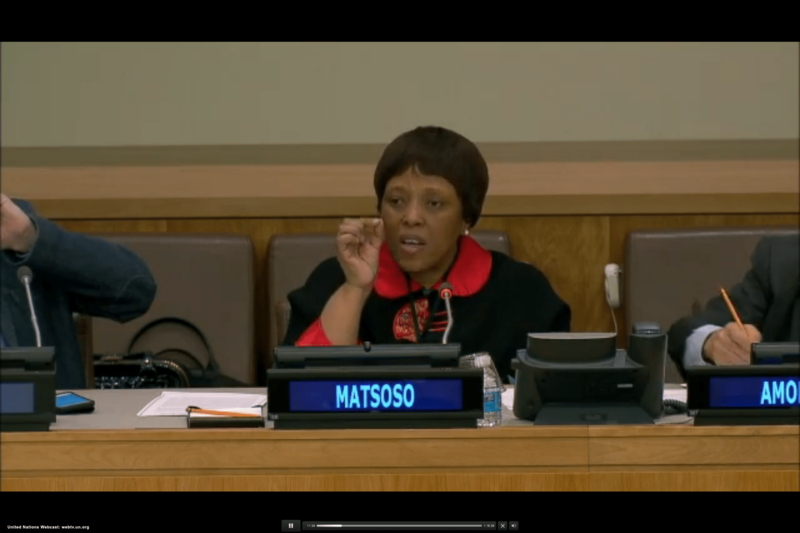 In a startling statistic, Matsoso said if 2001 figures for treatment were used, $US 340 billion would have been paid by now. The problem is made worse by “colliding epidemics,” she said, with non-communicable diseases such as diabetes, cardiovascular disease, and cancer. She also cited the “unfinished” work of child mortality. And she said, “We need to find a way to increase access, as we have seen with cancer,” referring to astronomical cancer treatment prices in some countries. Matsoso particularly cited regulatory barriers because of delays, but also mentioned legal barriers and procurement hurdles. Javier Bellocq, who said he was diagnosed HIV+ 30 years ago, passionately asserted discrimination as many still die from HIV and AIDS while he is still alive mainly due to the luck of his circumstances of being able to access and afford treatment. He noted that the right to health preceded trade rules that affect health, and that it is agreed at the international level that intellectual property rights must not be allowed to take precedent over the right to health. Under international agreements, “health must take precedence over profit,” he said. He mentioned the 2001 Declaration on TRIPS and Public Health. Amorim’s remarks echoed the Brazilian government’s statement to the High-Level Meeting on Ending AIDS, available here [pdf]. Amorim said there is a “political problem,” in that it only protects from dispute settlement, but not from retaliation of other kinds, such as cuts in aid for trade access, or undercutting access for a country’s exports, such as shipments of orange juice. Only the Human Rights Council can address that, he said. Agreements like the Trans-Pacific Partnership “are really a danger,” he added, not only for those in the agreement but everyone else too, because these agreements set standards that are brought to other regions. And it does not help that the multilateral negotiations are stalled. Amorim called for a debate or a legal discussion on trade and human rights. GlaxoSmithKline (GSK) head Andrew Witty framed the pharmaceutical industry position in his characteristically practical and more embracing way. He said looking back at the last 15 years that the focus should be on the great achievements. He highlighted numerous achievements and competitive advantages GSK has, but in the end strongly advised against significant change in the system of R&D that results in high-priced medicines. Witty said GSK is the biggest vaccine producer in the world and the majority is distributed to developing countries through GAVI and other means, praising also the Gates Foundation. From a policy perspective, he urged a move away from old ideological battles (such as over access and intellectual property rights) and rather to look at what has been achieved over the past 15 years. For instance, there has never been a level of public-private partnerships as there is today. On antimicrobial resistance, Witty acknowledged that people are starting to look at de-linkage of price from the cost of research and development in that case. Witty, a member of the UN Secretary-General’s High-Level Panel on Access to Medicines, said his recommendation is that healthcare is not one problem but rather many problems, with complex issues. Access is an overarching issue, he said. He mentioned Ebola, and said simply, “the world could not react to Ebola,” though he gave a nod to the speaker next to him on the panel, who came from Médecins Sans Frontières (MSF, Doctors Without Borders), which led the response long before global health agencies did. He did not mention the R&D model Ebola may have created that could change the old R&D model of high prices for patented products after industry rapidly developed a treatment for Ebola in record time and at low cost. “But if the price of access is no more innovation, then this will be the most selfish generation in history,” said Witty, as we will treat ourselves but leave nothing for the future. It was unclear from this statement whether Witty sees a possibility of finding an alternative approach that could continue to support R&D but would result in affordable products for all, which is the focus of the High-Level Panel he is on. Rius literally cried through her entire presentation as she gave an impassioned plea for a change to the system that unfairly leaves millions of people without treatment worldwide due to high prices or other barriers to access. “First, community mobilization and advocacy to make prevention, treatment and care for HIV and AIDS a right. These actions led to the establishment of national health programs, the Global Fund to Fight AIDS, Tuberculosis and Malaria and PEPFAR. Second, making treatment affordable by promoting quality generic competition, including by challenging and overcoming intellectual property barriers through the use of TRIPS flexibilities and other measures. Third, placing HIV and AIDS within movements for both access to health care for all, and more broadly, for social justice. The response to HIV and AIDS ultimately became much more than just a response to a disease; it galvanized a broader movement of health for all and for the dignity of all individuals. Fourth, to defeat the stigmatization and discrimination of marginalized populations, and to empower these communities to be agents of change for themselves and the broader response. She said people in the middle income countries are “trapped” because of the categorisation of their countries’ economic level that results in higher priced medicines there and less help from international organisations. TB treatment remains “toxic, painful and less effective,” and needs to be addressed by R&D, she said. She also mentioned AMRs. Meanwhile, trade agreements are being negotiated to further expand IP rights and limit public health access, she said. For example, the TPP is the biggest of the “abusive” TRIPS-plus trade agreements. “Civil society is once more leading the push back” against these concerns, when it should be policymakers, she said. She mentioned the need for de-linkage of medical product prices from stated R&D costs. And she called for new norms and standards, and for governments to set new agreements. She said there is an opportunity with AMRs, and the upcoming High-Level Meeting on that subject planned for September. He called for governments to take regulatory steps, such as South Africa, which he said could take the lead in registering drugs faster. An audience member raised concern over restrictions to cheaper drugs being put on middle income countries, and said, “We need a Global Fund that remains global,” referring to the Global Fund for AIDS, Tuberculosis and Malaria. "Alongside UN Commitments To End AIDS, Event On Access Brings Tears, Vision" by Intellectual Property Watch is licensed under a Creative Commons Attribution-NonCommercial-ShareAlike 4.0 International License.